The leader of Jordan’s largest Islamist opposition group is calling on people to topple the country’s prime minister as 2,000 protesters took to the streets demanding he resign. Anger has been rising over a decision by Jordanian lawmakers to clear Prime Minister Marouf Al-Bakhit of involvement in a casino scandal during his previous 2005-2007 term. 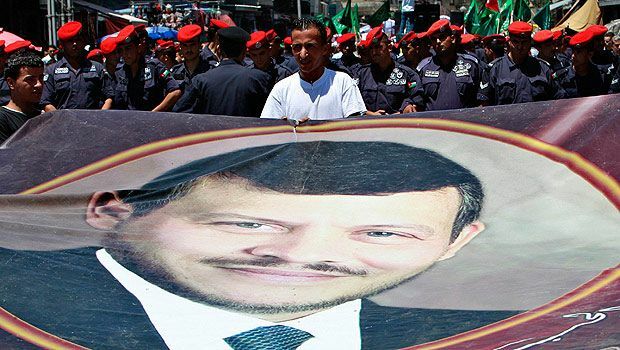 Muslim Brotherhood leader Hamam Saeed told nearly 500 people in a speech Friday that if Jordanians want “freedom,” they must “rise against their corrupt” prime minister. Jordan has been rocked by four months of street protests pressing for economic and political reforms and inspired by uprisings elsewhere in the Arab world. 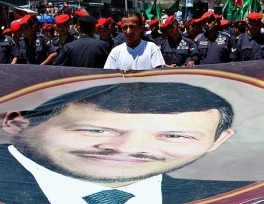 Jordanians Take to Streets as Thousands Demand "Fall of Regime"